Aquaponics: it's not a word in most people's vocabulary, but it had a big part in causing my parents and I to move across the country. We set out for the adventure of our lives, and that’s saying a lot considering we were always a traveling family. My parents and I were quite the caravan, with a moving truck pulling a jeep and trailer, and a pick-up truck puling a trailer and motorcycle. The drive from Arizona to Florida should only have taken four days, but we had so many technical difficulties it took us twelve days! Based out of central Florida is a non-profit organization called Morning Star Fishermen (MSF). They are involved with missions around the world concerning the race against hunger, and operate an aquaponics training facility. While MSF does teach aquaponics for individual use and commercial use, their passion is to use it in 3rd-world countries as a sustainable food source in starving communities. One summer my father and I visited MSF to take their aquaponics training courses so we could set up our own system in Arizona. The founder of MSF offered my dad a job as Executive Director: my dad accepted the position. In two short months we went from rocky soil and cactus, to green grass and orange groves. I didn't wait a day after arriving to get involved with MSF and aquaponics. If I didn't open up the greenhouse and feed the fish in the morning, then I closed up and fed at night. It's my responsibility to photograph anything noteworthy happening as MSF, such as classes, volunteers working, ongoing projects ect. We use these photographs to promote and keep our website and facebook page up to date. Below is a clip from a video that was made by MSF. I had the privilege of filming most of the underwater footage and a portion of the other shots used in this video. Plants don’t actually need soil, they need the nutrients that is in the soil. In an aquaponics system, the plants get their nutrients from the fish waste. Fish are in one tank and pollute the water with ammonia and solid matter, that water is then siphoned into another tank where plants are growing in water without soil. The plant roots absorb the fish waste, as a result, the water is filtered and purified, then sent back in with the fish. The water is always flowing from tank to tank. If the water, fish, and plants are in the right proportions to each other, no minerals need to be added, and it yields fish and produce! All of the fish you saw in the video were tilapia. Tilapia are the best fish for aquaponics because they are extremely hardy and reproduce very fast. Fish grown aquaponically don't have that fishy taste, and there are limitless ways to season them: my parents and I have fish for dinner about once a week. The image on the far left is my dad holding a tilapia after netting it from one of the tanks. The picture on the right is one I took during one of MSF's training courses. The instructor set the fish out for 2 hours and 15 minutes and then put one back in the water to show the students how tough tilapia are, the fish was fine... the other two were cooked for dinner that night. There is a vast array of plants that grow well aquaponically. 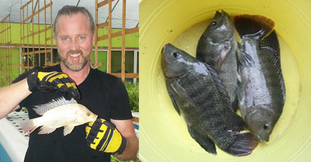 The three images below were taken at Morning Star Fishermen's aquaponic greenhouse in Florida. The photo on the left shows a tomato plant thriving on the nutrient rich water (thanks to the tilapia). The photo in the middle displays a variety of vegetables and herbs growing in floating rafts. The photo on the right is a floating raft lifted up to show the healthy root systems of peppermint plants. While some people are using aquaponics for mass production, and it does yield healthier pesticide free produce, there is not great demand for aquaponically grown produce. More people are using aquaponics for their own use. There are limitless ways to set up a system, so people are able to be very creative and thrifty. I have seen systems using 50 gallon barrels cut in half, old bath tubs, or even just a hole in the ground with a liner. Because aquaponics requires almost no specialty products, it is an ideal food producing system to establish in starving communities. That's what Morning Star Fishermen does, they send out one of their instructors to a starving village where he can help the locals build a system and then teach them how to maintain it. Founder of MSF, Hans Geissler in Malawi Africa to help the locals start up their new system. This is part of the story of how a science in biology has changed my life forever. I plan to continue Morning Star Fishermen's legacy by traveling to other countries and building aquaponics systems. I look forward to being able to make a difference in peoples lives with compassion and a simple understanding in biology.